Our journey started when we closed our front doors behind us, but the experience of Romania began when we landed at Cluj-Napoca late in the evening: fellow passengers burst into applause as the plane bumped onto the runway. Our guides, Martin Clark & Monica Oprean, welcomed us at the terminal. There were nine participants altogether: four from England and five from Scotland. In actuality it was a far more international group than this – the ‘English’ group consisted of one Briton, one American, one Greek and one Algerian. The ‘Scottish’ group contained two Britons, an American, a Scot and a South African. The next morning, we met to discuss the coming week. The itinerary was full: visits to two churches, an Hungarian village, a cave, forests, fields, water buffalo, local markets, as well as loading, stoking, and unloading the limekiln and painting a wall. As the week progressed, even more was shoehorned in – visits to a third church, a field barn, an underground glacier, and an antique trove. We squeezed into the two cars and set off towards the west and burgeoning cloud cover. A picnic had been planned, but by the time we arrived at Rimitea/Torocko, it had started to rain, so lunch was had in a nearby restaurant. Rimitea, we were told, is an ethnically Hungarian village, and as such has different architecture and traditions. Busy with tourists visiting the many shops and walking down the dirt lanes, the village has a stunning backdrop of grey mountains and terraced fields. We had a long drive ahead of us to get to our first planned stop at Vidra-Goieşti, but we broke it briefly near Sartǎș. Here, after climbing over a split rail fence, we visited a traditional field barn. The roof is pitched steeply to shed water and to expose the smallest area of the thatch to the weather. In design, they are probably similar to thatched rooves built in prehistory. These thatched barns are increasingly rare; we only saw this one and another restored one. The haystacks, which call to mind Monet’s paintings, are everywhere. The hay is hand-cut by scythe before being stacked around a central pole. Quite often they are supported by three or four struts as well. We saw very little hay that had been mechanically baled. A further drive along the winding Arieş River, and a turn into the mountains, brought us to our first church. Cradled in a remote valley of the Apuseni Mountains, the small church of Vidra-Goieşti is a sadly neglected gem. Built in 1712 and painted by 1791, it is a rectangular church with a polygonal apse. The nave is divided into three sections – one third at the west end, separatedby a wall from the middle two thirds, and the apse at the east end. The smaller section at the west end is where the women sit; there are large openings in the walls for them to see the service. The barrel-vaulted church is built of wood on a stone foundation. The exterior timbers, square cut, are keyed together at the corners like a log cabin. The paintings, darkened by candle smoke and stained by water, still retain some of their original freshness. The nave ceiling is decorated with scenes from The Passion, saints, the Evangelists, the dove of the Holy Spirit, cherubim, and other figures. The western wall of the central section is painted with the Last Judgement, with the entry of the righteous into Heaven on the left and the fall into Hell on the right. The eastern wall, which separates the nave from the apse, is partly obscured by icons. We were not allowed into the apse, as that is the most sacred part of the church. The next day, we visited two more churches, both in Gǎrda de Sus. The first, built in 1792 and decorated in 1804, is a small wooden church, similar in size and style to the one at Vidra-Goiești. It also shares the same artist for the interior painting. Unfortunately this little church, with its intricate door frame, has suffered serious damage. Its roof has been replaced, the rendering renewed, and it has been set back on its foundations, but about two-thirds of the interior paintwork is irretrievably gone. Some flaking areas have been repaired with tissue. The floor of the rear third is gone, and there are supports in the nave. Right next to it, to the west, is a large new church, built in a more modern yet still conservative style with white stucco exterior and turrets with reverse-curve domes. It was begun in 1989, and the interior decoration was completed in 2001. It is shockingly colourful compared to the little church it replaces. Yet even though it is so new, there are signs of water damage in some places. On the eastern side of the wall separating the nave from the vestibule, there are four portraits. Unusually, three are from life – of the parish priest, the archbishop, and Patriarch who were in post when the church was built. Like a donor in a medieval or Renaissance painting, the parish priest holds a model of the church. The fourth portrait is an idealised one of St Hierarch Ghelasie de la Râmeț, archbishop of Transylvania in the 14th C.
It was interesting to note the differences between the two old churches and the new. The wooden churches, similar in style to Norwegian stave churches, were decorated in a naturalistic 18th century style. The new church, in contrast, harked back to Byzantine mosaics, with stylised, stiff compositions. Although the iconography was the same, the style of conveying it was different. As well as the churches, we also visited a glacier – underground. Located in the Apuseni Mountains, up a bumpy twisty windy road near Gǎrda de Sus, it was first mapped in 1863. A walk up a stony path from the hamlet of Ghețari takes you to the entrance. The glacier, 48m below in a large cave, is reached via a descent on narrow, metal-grid steps. At the bottom, the steps are wooden, and a wooden walkway circuits the top of the ice. At the end of the guided tour, the exit is via the same stairs. It is thought that the glacier started to form between three and four thousand years ago, at the end of the last Ice Age. It is interesting scientifically: the cave topography and ventilation has allowed its preservation; and the layers in the ice can be used to measure historic atmospheric carbon levels. The next day we began the main purpose of the trip, the course in traditional limeburning. Lime, which has been largely replaced by concrete in the modern world, was once used extensively for building (in mortar, putty, rendering, whitewash) and in decoration (whitewash, plaster, paint medium). Over the next few days, we were to learn the process of turning limestone into quicklime. The limekiln is located about a mile from the limeburners’ farm in Meziad, by the side of a stream. It is built of river stones mortared with clay, both from the stream. It had recently been partly demolished by drainage works and had been rebuilt. All the limekilns we saw – and there are others now unused in the village and further up the valley – are by a stream, to facilitate mixing of clay, which is used to seal the top and door of the kiln. The kiln is roughly round and slightly conical, with the wider end at the bottom, and open at the slightly narrower top. An earthen ramp leads to the top on one side, where there is an opening in the kiln wall. On the opposite side there are two small square openings, about a foot square, one at ground level and another a few feet higher. The inside of the kiln has a stepped profile, narrower at the bottom then widening. This ‘step’ provides a foundation for the first rows of limestone. Next to the side of the kiln with the small openings, which are stoking holes, is a corrugated-roofed lean-to shelter, complete with sofa. The task for the day was to load the kiln, then start the burn. The large rocks of limestone had already been broken into smaller pieces by Dumitru, the limeburner. Unfortunately he was unable to participate fully in the burn due to a recent operation on his foot. The limestone isn’t just piled in the kiln. As with loading a kiln for ceramics, there needs to be space for both air and fuel. In a limekiln, this is accomplished by building a dome of limestone at the bottom of the kiln. First, a ring of smaller stones is laid on the ‘step’ inside the kiln. Next, a row of larger stones is placed on top. Being larger, they protrude slightly towards the centre of the kiln. As rows of stones are added, they are placed so that they gradually cover the centre of the kiln, forming a corbelled dome. Initially the dome-builder works standing in the centre of the kiln. But when the dome is about chest-height, he climbs out and continues laying stones while standing on the outside edges of the dome. Each stone needs to be carefully placed so that they nestle comfortably and securely, but not snugly, against adjacent material. Some stones, if difficult to cantilever, are supported by props. Finally, the gap in the top of the dome is capped with one large stone. The structure should be secure enough to support a man’s weight – and the weight of the limestone in the burn. Once the dome is built, the kiln is filled with stone. Again, each is carefully placed to allow maximum air flow. When the level in the kiln reaches the level of the ramp, the ‘door’ is infilled with river stones mortared with clay. More stone is added to the kiln, until it is full almost to the top. The final step is to spread a layer of hay on the stone, then cover it with a layer of clay/mud. A hands-width gap is left between the kiln wall and the cap to allow for expansion. The hay tempers the clay to reduce shrinkage. When all this has been done – it takes a team of at least six people six hours or more – the kiln is stoked with wood and lit. Then the burn proper begins, and the kiln is attended continually until the firing is finished, in about 48 hours. A team of three works in shifts to stoke the kiln. While the burn progressed, we took part in other activities. One activity was to decorate a wall at the farm. Two other exterior walls had already been decorated, using patterns enlarged from Silvia’s embroideries. After deliberation, we decided to use an asymmetrical rose as part of the design. The rest of the design was based on painted curtains we’d seen in the two churches in Gǎrda de Sus. Martin showed us some of the pigments available – reds, browns, and yellows from earth pigments, greens and blues from elderberries and copper sulfate, blacks and greys from charcoal. Lime was the medium for the pigment. Under Peace Townsend’s supervision, we marked the wall with a grid, then transferred the charted pattern using different symbols for different colours. Peace and Stacey Rowntree were our paint mixers, and concocted shades of green, red, yellow, blue and grey. After spritzing the wall with water, to help the lime to bind, the wall was painted, all in an afternoon. We painted two or three at a time, on different sections, to get it done on time. Another wall at the farm, of bare brick, was covered with lime-based harl. Will Napier made the mix and supervised the work. We also visited a small herd of water buffalo. Kept on common ground not too far from the village, they shared a small patch of forest pasture with cows. Initially suspicious of such a large group of people (there were a dozen of us), they realised quickly we were not a threat when we didn’t make loud noises or move suddenly. The herder told us the buffalo like to chase motorbikes, and as if on cue, a quadbike buzzed across the common. Several of the water buffalo set off in pursuit; the herder said they didn’t like the noise. The common is next to a forest, which had once been managed in small sections by individuals. In the Communist years, the forests were amalgamated. Now the forests could be returned to the original owners, but many cannot prove ownership or are no longer interested. Many of the trees in the forest had been coppiced in the past, but as life in rural Romania changes, this no longer occurs. On our final day in this part of Romania – the town of Beiuș and the village of Meziad in Bihor County – we visited the weekly market in Beiuș. In actuality, there are two separate markets in different parts of town. One is a market for farmers, where tools, implements, seed/grain, piglets, wood, lime, cowbells, bridle ornaments etc. were sold. The other market lined the streets and filled the market hall near the centre of town, and produce, household goods, used and new clothing, etc. are available there. For two days, the kiln had been burning; we had been checking it periodically. After this time, when the burn was complete, the kiln was shut down. The indicators for a finished firing are the collapse of the cap, the change in the flame from yellow to clear, and the lack of smoke. A metal plate (in this case, a car bonnet) is placed over the stoking holes, and the kiln is left to cool. It was ready to start unloading a day later. The cap, now in pieces and baked to bisque-hardness, is removed as much as possible. And as for the loading the kiln, the finished product is taken out piece by piece. The quicklime weighs about half as much as the stone that went in. In this case, 8 tons of stone went in to yield 4 tons of quicklime. After a last lunch at the farm and final farewells, we crammed back into the cars for the drive to Cluj-Napoca and our final night in Romania. On the way we stopped at an antique shop in Izvoru Crisului, a treasure trove of antique farm implements, crockery, textile tools, and textiles. Outside, implements, crockery and furniture was displayed, and inside was a treasure trove of traditional textiles – jackets, shirts, blouses, skirts, aprons, boots, blankets, pillow covers, cloths – piled a metre high on tables and hanging from garment racks. It was overwhelming. During our final evening in Cluj, we visited the central Piața Unirii, with the Church of St Michael and the imposing statue of Matthias Rex. There are also Roman ruins on view on the Piața, viewed through a plastic enclosure. Although it was nighttime, we could see that Cluj is a beautiful city, mostly built in an Art Nouveau style. Our time with our guides ended later, when we returned to the hotel. We had an early start in the morning, so they said their farewells now. As a memento, Monica gave each of us a book on Romania, full of photos of churches and landscapes that we will need to return to see. 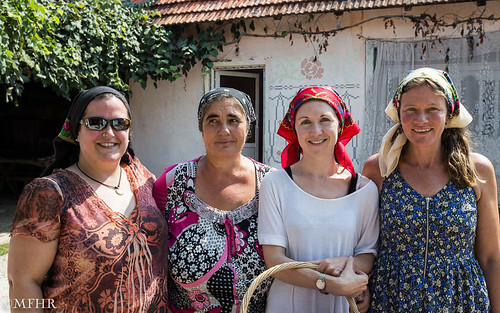 Elderly women in black headscarves – they aren’t just in the pages of the National Geographic. This course was funded by Erasmus+, organised by ARCH, and delivered by Satul Verde.